The hybrid-electric "E-Fan X" is expected to fly in 2020. One form of transportation that has yet to see the same amount of progress is airplanes, though that isn’t to say there aren’t any projects focused on bringing the idea of electric aircraft to the skies. The problem is, passengers can’t ride in an electric plane as easily as they can an electric car. At least, not yet. 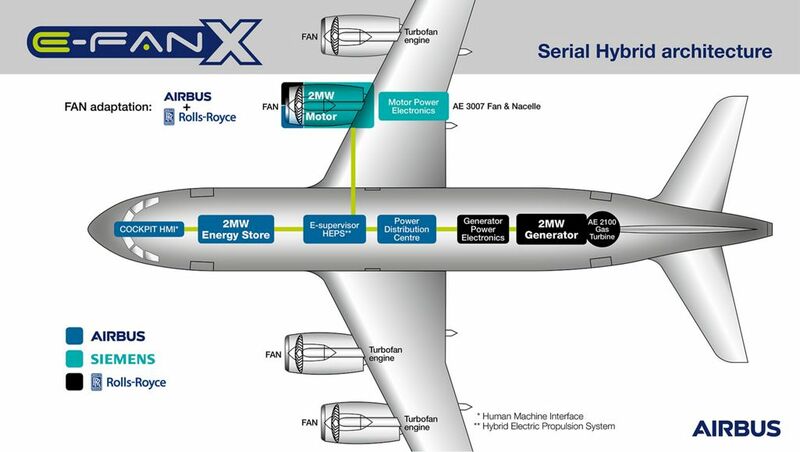 Now, Airbus, Rolls-Royce, and German automation company Siemens have announced a partnership to undertake a project that would convert a plane to utilize electric propulsion. The trio has dubbed the project “E-Fan X,” which involves gradually replacing the BAe 146 airliner’s gas turbines with two-megawatt electric motors. In a statement, Airbus’ Chief Technology Officer Paul Eremenko explained how the E-Fan X is actually the culmination of work that’s been done on previous electric plane projects. The three companies will each be in charge of separate parts of the project. Airbus will oversee the aircraft’s overall integration, which includes the control architecture of the hybrid-electric propulsion system and batteries, as well as integration with flight controls. Rolls-Royce will provide the turbo-shaft engine, two-megawatt generator, and power electronics, and Siemens will provide the two-megawatt electric motors, power electronic control unit, DC/DC converter, and power distribution system. The E-Fan X is expected to take off after “a comprehensive ground test campaign” in 2020 — 2 years before the aforementioned Zunum Aero. When it debuts, it may have competition with the Eviation Aircraft, which is capable of transporting 9 passengers across 600 miles on a single charge. There’s also Airbus’ own flying electric taxi, which is set to fly in 2018, and the environmentally-friendly airplanes NASA has invested $43 million into. That said, the agency’s commercial airplanes aren’t expected to hit the skies until around 2026.